What can you say about the Justice League of America that hasn't already been said virtually everywhere else. 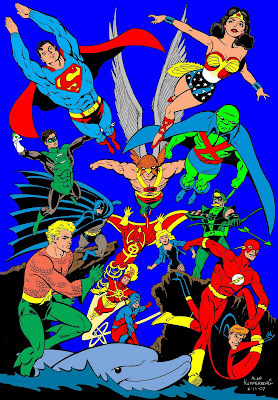 Before the Fantastic Four, the JLA were the group that relaunched super hero team books for the Silver Age. Legend has it that Marvel publisher Martin Goodman was golfing with his DC counterpart Jack Liebowitz. Liebowitz boasted about the sales that his new book, the Justice League Of America, was gaining. Goodman returned to the Marvel offices and ordered Stan Lee to come up with a suitable counterpart. Lee and his co-creator, Jack Kirby, then brought the Fantastic Four to life, with Kirby going as far to swipe the cover design of the JLA's initial appearance (Brave & The Bold #28) for the first issue of the FF. My mother loves Elvis Presely and his movies. She has them all on DVD or video, take your pick and she'll sit and watch them for hours on end. She's always tried to tell me how great they are, and, truth to be known, some aren't that bad, although I can reduce to her abuse and laughter by uttering one word: Clambake. The concert movies are watchable, and the first, pre-Army Elvis movies kind of work. Elvis movies reached their peak for me in his last one, Change Of Habit, where Mary Tyler Moore(!) played a nun who has to choose between the Church and Elvis, who plays a doctor. As if Mary as a nun didn't already spin you out - Elvis as a doctor? The mind boggles. You can imagine all the prescriptions that Elvis would be writing, not to mention how many times he'd be dipping into the drug cabinet. Self medication here we come!